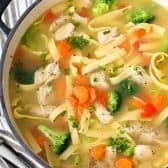 A hearty chicken noodle soup recipe. Juicy chicken, tender egg noodles and fresh vegetables all simmered in a flavorful chicken broth. Chop the onion and add to the pot. Continue adding veggies to the pot in order as you chop them except broccoli. Cook until onion is softened, about 5 minutes. Stir in seasoning, broth and chicken. Bring to a boil, add noodles reduce heat to medium-high and cook until noodles are tender. Add in broccoli during the last 2 minutes of cooking. Stir in parsley and remove bay leaf before serving. If you prefer more broth you can add 8 cups.